Sometimes you bake a giant chocolate chip cookie (like...even by my big-cookie-lovin' standards). And sometimes you form a rice krispie treat around it. 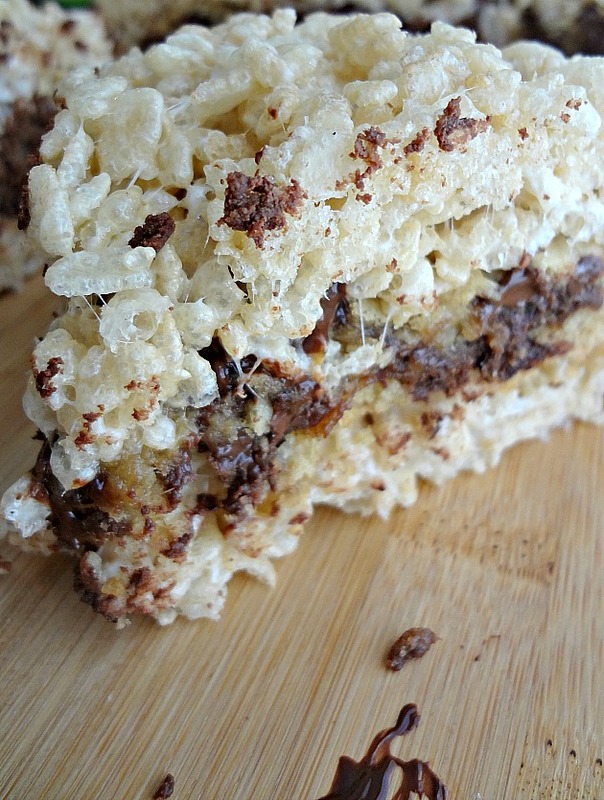 And then you have an inception treat--a delicious ccc within marshmallowy rice krispie goodness. Now I'm gonna tell you right now--even I don't advise that you just have a mega-giant ccc stuffed treat. I'm gonna firmly advise that you cut that thing into wedges. It's the smart thing to do. Your tummy will thank you. Plus...it makes eating it much easier. As much fun as it is to have a "I'm gonna need a bigger mouth" moment....seriously. You'd need a bigger mouth. 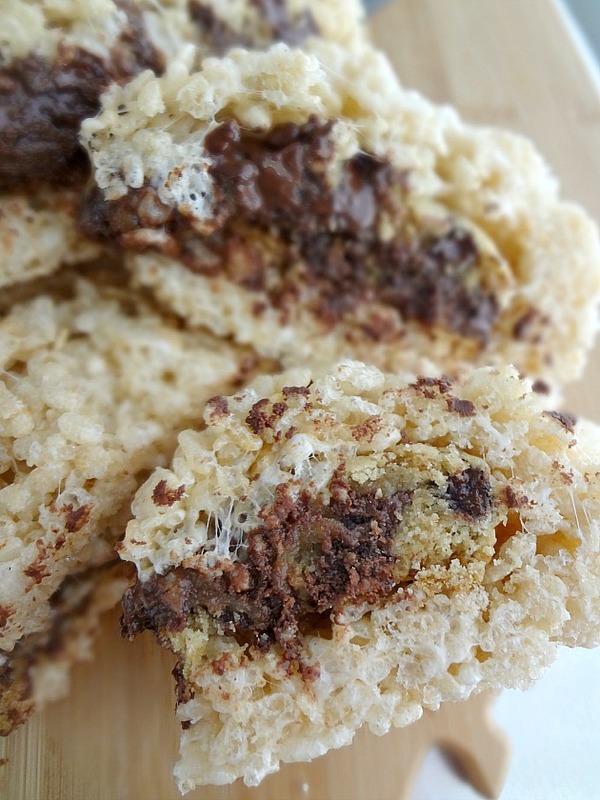 And then you get to comfortably bite into a crunchy-yet-gooey krispie treat exterior and be met by a chewy chocolate chip cookie. And I'm a big fan of having it slightly warmed up, so you get an extra gooey factor. But that's just me. 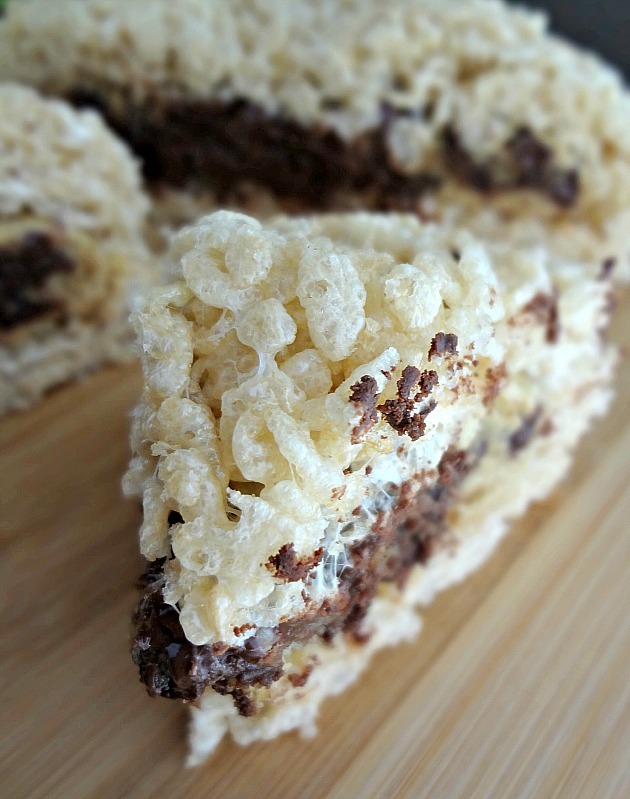 Makes 1 giant cookie stuffed krispie treat, cut into 6-8 wedges. Preheat oven to 350F degrees. Line a baking sheet with parchment paper or silicone baking mat. In a medium bowl, beat together the softened butter and sugars until light and fluffy, about 1 minute. Mix in flour, salt, and baking soda until just combined. Form dough into a large cookie (about 1 inch thick) on prepared baking sheet. Bake for about 15 minutes, until the edges are turning golden and the middle is set. Let cool on sheet for 10 minutes. In a microwave safe bowl, microwave marshmallows and butter for about 1 minute-until puffed. Quickly stir in the rice krispies until evenly combined. Divide rice krispie mixture into two and take one half and flatten into a round just slightly bigger than the cookie. 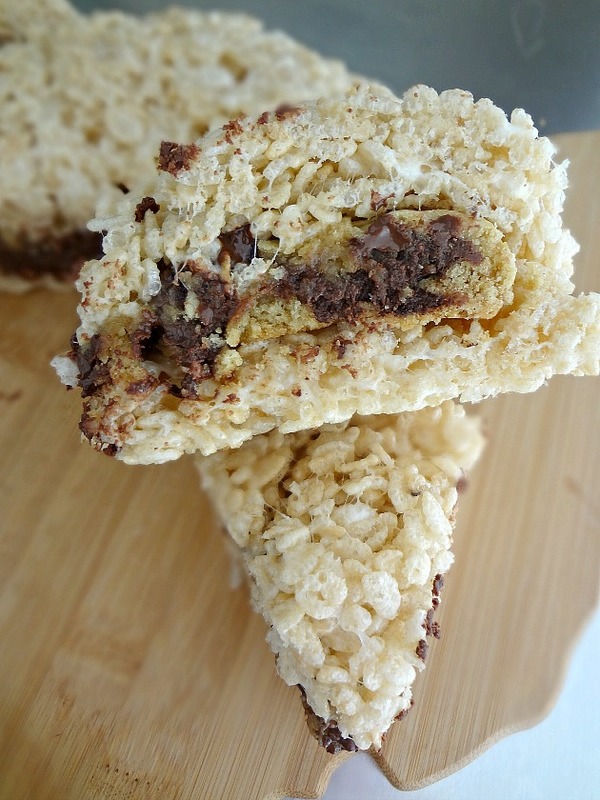 Place the cookie on this krispie round and then take the rest of the mixture and press on top and seal the rice krispie treat around the cookie, smoothing it out as you do so-it should be round. Let it cool for a few minutes and then cut into 6-8 wedges. Serve! Store leftovers in an airtight container at room temperature for up to 5 days. Stuffing desserts inside other desserts is just a good idea.